Discover cultural tours in Golden Triangle in March 2020, visiting places like New Delhi and Agra. Book now and save with TourRadar.com! 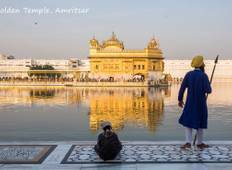 "Our trip to India will always be cherished for it became a memoir of lifetime and..."
"On the go tours made our trip to India an unforgettable experience. Our tour guide..."
"Everything has been perfect in our Indian tour thanks to the perfect organization..."
"Service was excellent! We loved that this tour company is Indian. Drivers know how..."
"Fantastic tour and a great Guide!!!" "Fantastic! Really loved the trip. Everything was perfectly planned with utmost care..."
"Rags/Ragu made the trip for us. Great guy, G Adventures are lucky to have him. Guides..."
"This was an amazing itinerary packed full of temples, forts, palace visits - great..."
"We had just a week’s time and wanted to cover most of Rajasthan by road. Mr. Raja..."
"The trip was awesome, everything was well organised. This was our second trip with..."
"I am so glad that i choose to go with GeTS Holidays. They were very prompt in responding..."
"My Mumbai Trip 2016. From the start, while planning and arranging the trip, Gets..."
"I spent 6 days travelling to Delhi, Jaipur, Agra and Amritsar with Gets. The tour..."